I have to admit that when I started on my honors project “The Three Founders of Botany: Rare Works from Special Collections,” I knew little about botany. I personally do not have a green thumb: most plants that I have tried to grow in the past have quickly died. This is why I study history instead of botany. However, after I started reading about the three founders of botany, my interest and knowledge in the topic increased. I especially enjoyed looking at the books written by the three founders, printed from 1530-1552. These books have been well taken care of to last as long as they have and the illustrations are beautiful. 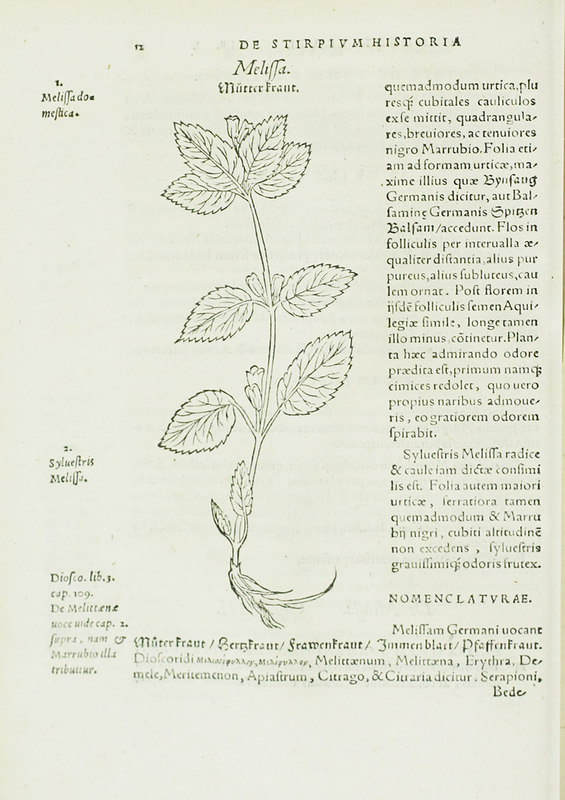 The information provided by these herbals is not limited to botany; they can also be used to study medicine, art, collaboration, and printing. The three founders of botany were Otto Brunfels (1488-1534), Leonhart Fuchs (1501-1566), and Hieronymus Bock (1498-1554). These three German physicians established botany as a discipline independent of medicine in the sixteenth century. The importation of plants from the New World, the use of personal observation instead of folklore, and the development of the scientific method helped botany become its own field. The three founders wrote herbals to spread their knowledge. Herbals were books written to identify plants and explain their medical uses. In the sixteenth century, woodcut illustrations began to be included in the herbals to more easily identify plants. Brunfels wrote Herbarum Vivae Eicones between 1530 and 1536. The book included new botanical illustrations drawn from nature. Brunfels compiled information from classical and medieval authors, some of which was inaccurate. Hans Weiditz created the revolutionary illustrations for the herbal. Fuchs published De Historia Stirpium in Latin in 1542. The folio editions of the book weighed about 11 lbs., but smaller editions were printed for field botanists. His artists generalized plants from nature to show the standard of a plant species. One image showed the different seasonal stages of the plant; this was done for economic reasons. De Historia Stirpium was the first herbal to illustrate native plants from the Americas, including pumpkins, chili peppers, and corn. Bock first printed New Kreuter Buch in 1539 in German and did not include illustrations because he could not afford them. 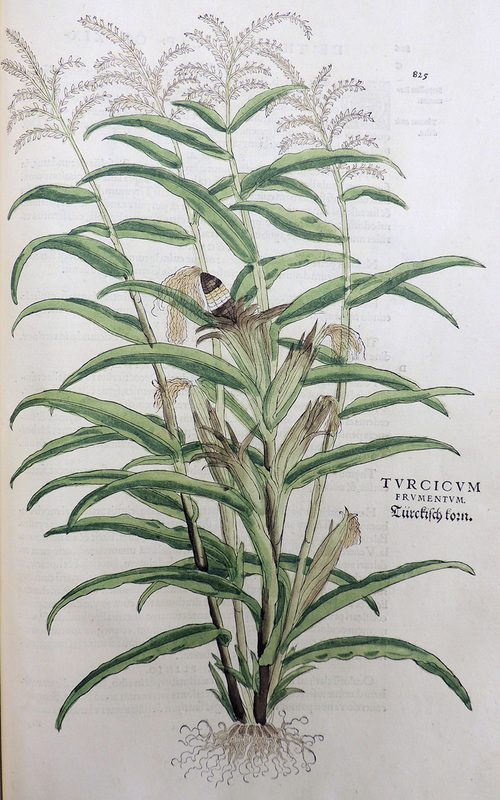 The herbal became widely known after its publication in Latin in 1552 with illustrations. Bock was one of the first botanists to excel at writing descriptive records of plants (phytography). He observed nature to write his own, new descriptions. He was also the first to recognize the need for botanical classification. For my honors project, I created an exhibit on the three founders, including their herbals. 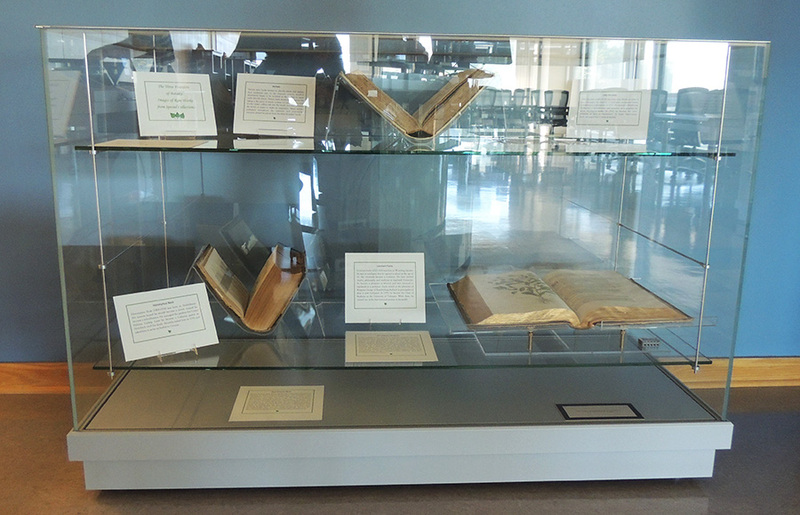 It was on display in the Special Collections Reading Room from May 3 through October 15, 2013. I also wrote an exhibit catalog and created a website. It was a very educational and worthwhile project. I gained experience writing exhibit labels, making Plexiglas book cradles, and creating a website for the first time. This project taught me to stick with history instead of botany. I would like to give a big thank you to Michele Christian for being my project advisor! If you would like to learn more about the founders and their herbals, read the exhibit catalog http://lib.dr.iastate.edu/speccoll_exhibits/3/ and check out the website http://www.add.lib.iastate.edu/spcl/exhibits/botanists/index.html. Interested in viewing the three herbals? Please visit the department on the fourth floor of Parks Library (M-F, 10-4). The call numbers are below.